For the current range, Liebherr has put in place a distribution network of around 500+ showrooms across 50+ cities in various regions. This includes partnership with organised retailers and local organised players in the country to retail the products. 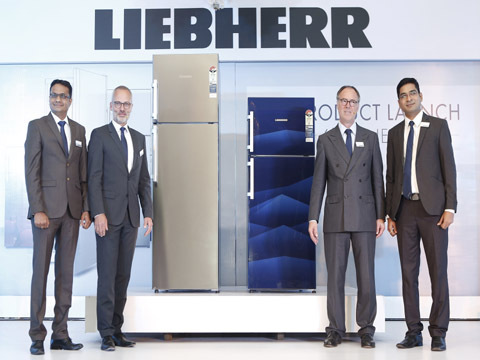 New Delhi: Leading German refrigerator manufacturer, Liebherr has launched range of refrigerators in the mass premium segment for India market today. They will be available across its dealership network in major Indian cities spanning across south, west and north regions of India. The price range for these refrigerators begin from â‚¹ 23,500 for the basic model to â‚¹ 1,50,000 for the top end models. The refrigerators are manufactured at Liebherr Appliances India’s Aurangabad Factory which was inaugurated last month, the company said this in a statement today. “Liebherr has always focussed on creating solutions that puts the contemporary customer’s needs at the forefront. Our refrigerator range for India has been designed keeping this in mind – bringing the best of German technology customized to suit the Indian audience, with features like specially designed SpiceBoxes, ultra-protective VarioSafe, convenient Vegetable Sorter System and Unique CoolPack etc. Along with achieving customer satisfaction, our objective is also to provide products that use energy more efficiently,” said Radhakrishna Somayaji, Chief Sales Officer, Liebherr Appliances India Private Limited. Elaborating on the brand’s Indian journey, he said the company started the project “Liebherr Appliances India” in 2014. This project was from the very beginning inspired by the idea of “Engineered in Germany, designed for India”. The products will be available at retail outlets across the country from 2nd week of June’2018. The new launch across segments will be promoted through a holistic 360-degree marketing activities that includes a press campaign supported with a digital marketing campaign and region-specific outdoor, BTL activities. To maintain its global service standards, in India Liebherr has already set up service partners at all the locations where they are going to sell and the customer care helpline 1800 2333 444 is already operational to cater to any sort of customer queries. The Liebherr Group consists of over 130 companies, in more than 50 countries covering every continent and employs almost 44,000 people. In 2017, Liebherr achieved a consolidated turnover of more than 9.8 billion euros. This decentralised group of companies is divided into operatively managed and autonomous business units. The Group's central holding company is Liebherr-International AG, whose shareholders are exclusively members of the Liebherr family. Liebherr-International AG is located in Bulle, Switzerland.